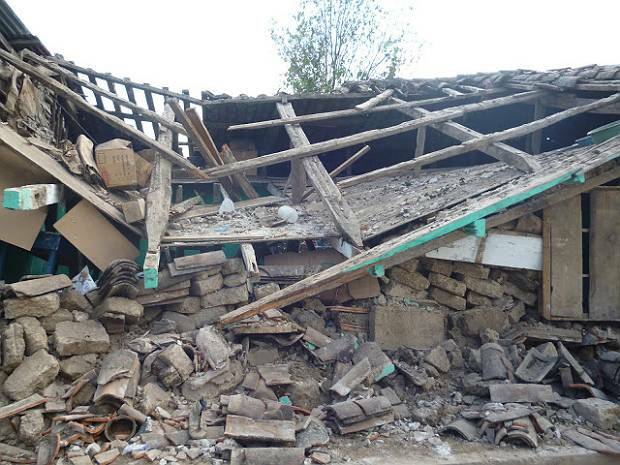 A severe earthquake of M 7.4 struck the western region of Guatemala on November 7, causing great damage throughout the region, including the loss of over 50 lives. 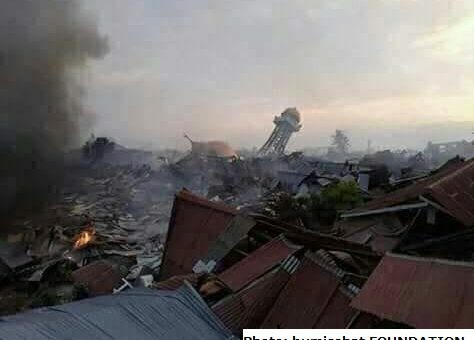 Although more than a week has passed since the disaster, many citizens are still suffering greatly, with a total of 1.2 million people thought to be affected. A Peace Boat staff member travelled to Guatemala on November 12, 2012 to survey potential support for the relief efforts continuing in in San Pedro, San Marcos and surrounds. This visit and support is being conducted in coordination with the Guatemalan NGO CEIBA, a partner organisation of Peace Boat. 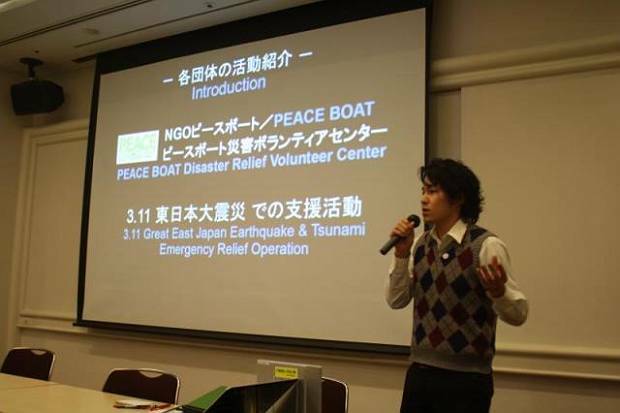 After going to Ishinomaki as a member of Peace Boat’s advance team in March 2011, then working as a volunteer coordinator in Tokyo, Takeda Nobuhiro is now working to coordinate support for Fukushima. He himself is also from Fukushima – from Koriyama City, also deeply affected by the 3.11 disaster. This interview tells of his activities in Ishinomaki, coordinating in Tokyo, and planning ongoing support for Fukushima including youth temporary evacuation projects and opportunities for dialogue amongst citizens. 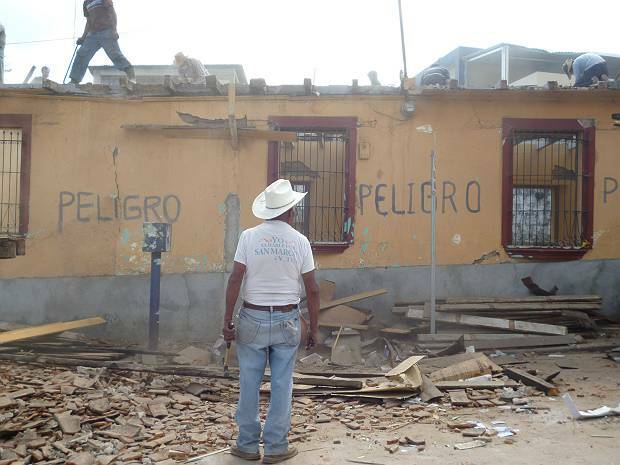 We are nearing the one year anniversary of the March 11 disasters. In this time, over 1,000 international volunteers from over 50 countries have come to Ishinomaki, together with over 10,000 Japanese volunteers, and provided much-needed assistance to survivors of the earthquake and tsunami. The city has made fantastic progress; and while there is still a very long way to go before full recovery, with your continued support, the city can begin to flourish once more. 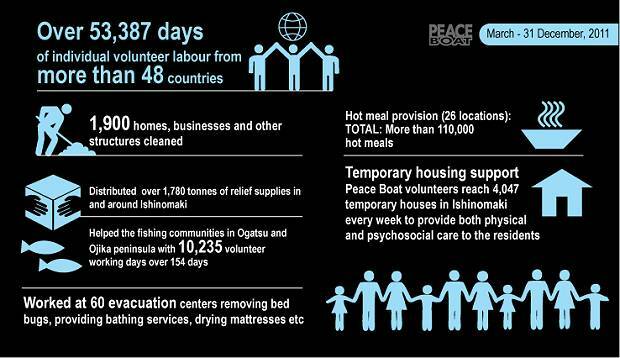 This report shares some news from Ishinomaki, more information about Peace Boat volunteer work and plans for the one year anniversary of the Great East Japan Earthquake and Tsunami.